Senior Lecturer of Crop Technology at the Royal Agricultural University in the UK. He has 29 years research and teaching experience in plant physiology, production, biochemistry and genetics. Currently he is focusing on developing daffodil germplasm with increased galanthamine and other alkaloids content and molecular markers, alkaloid analysis by GC-MS/HPLC, and daffodil tissue regeneration system. External appointments include FP7 & H2020 Expert (Candidate of Evaluator / Reviewer), Honorary Senior Fellow at Liverpool University, Research Consultant for Agroceutical Products Ltd, He has published over 40 research papers. Michael R. Ladisch is Director of the Laboratory of Renewable Resources Engineering (LORRE), and Distinguished Professor of Agricultural and Biological Engineering, with a joint appointment in the Weldon School of Biomedical Engineering, and a courtesy appointment in Food Science. His BS (1973) is from Drexel University, with MS (1974) and PhD (1977) from Purdue University, all in Chemical Engineering. He is continuing his activities with Mascoma Corporation, where he has been a contributor since 2007, and served as CTO from 2007 to 2013.
graduate at Ciências Biológicas from Universidade Federal do Ceará (1974), master's at José Tadeu Abreu de Oliveira did Biochemistry from Universidade Federal do Ceará (1980) and ph.d. at Bioquímica from University of Aberdeen (1986). Has experience in Biochemistry, focusing on Biochemistry, acting on the following subjects: vigna unguiculata, lectin, mecanismos de defesa, cowpea and pr proteins. Ricardo had graduated in 2003 in Applied Plant Biology in the Faculty of Science of the University of Lisbon, Portugal. Ricardo took a yearlong internship at Instituto de Tecnologia Química e Biológica (ITQB, Oeiras, Portugal) where Ricardo studied the impact of biotic stress in plant transcripts, to be more precise the effect of the pathogen Pseudomonas savastanoi on Olea europeae (olive tree), using the reverse transcriptase polymerase chain reaction (RT-PCR) technique. Immediately after finishing my degree Ricardo took a Master degree in Plant Stress Biology in the University of Minho, Portugal, where Ricardo was especially interested in drought stress and oxidative stress, and developed my Master’s project in selecting drought tolerant maize cultivars from six Portuguese varieties, through several techniques, including the non-invading chlorophyll a fluorescence and infra-red gas analysis (IRGA), assessing the photosynthesis during the onset of drought and also the recovery period. Ricardo received a Ph.D. in Biology (Physiology and Biochemistry) from the University of Lisbon, Portugal, in 2013, studying the physiological, biochemical and molecular aspects of desiccation tolerance in bryophytes. Ricardo am currently in the Ecology of Environmental Change research group of cE3c – Centre for Ecology, Evolution and Environmental Changes. Ricardo current research focuses on ecophysiology of bryophytes and ecological restoration using biological soil crusts. Ricardo currently collaborate with several overlapping groups of colleagues mainly working on a range of topics in (i) desiccation tolerance with Lloyd Stark’s research group (University of Las Vegas, USA); (ii) biological soil crusts with Stephan Peth’s research group (University of Kassel, Germany) and Roberto De Philippis’ research group (University of Florence); and (iii) green roofs with Instituto Superior de Agronomia (University of Lisbon) and Benz Kotzen (University of Greenwich). His current research is driven by three overarching objectives: i) identify ecophysiological processes and patterns affecting desiccation tolerance across poikilohydric organisms (e.g. bryophytes, lichens); ii) study the use of biological soil crusts in ecological restoration under the current climate change; iii) research green roof sustainability and ecological services using biological soil crusts. Farid Soliman Ismail Sabra is from Department of Chemistry & Toxicology of Pesticides, Faculty of Agriculture, Alexandria University, Alexandria, Egypt. The Relationships Between Chemical Structure and Herbicidal Effects of the Pesticides. Efficiency of the new herbicides against weeds in different Vegetables and field crops under different types of soil and irrigation. The Effects of the Herbicides on Non Target Organisms. Intgrated Weed Mangement under Egyptian conditions Herbicides Residues and Natural product in Environment. Herbicides Toxicology. Natural products from plants and seaweeds as pesticides (Allelopathic effects). 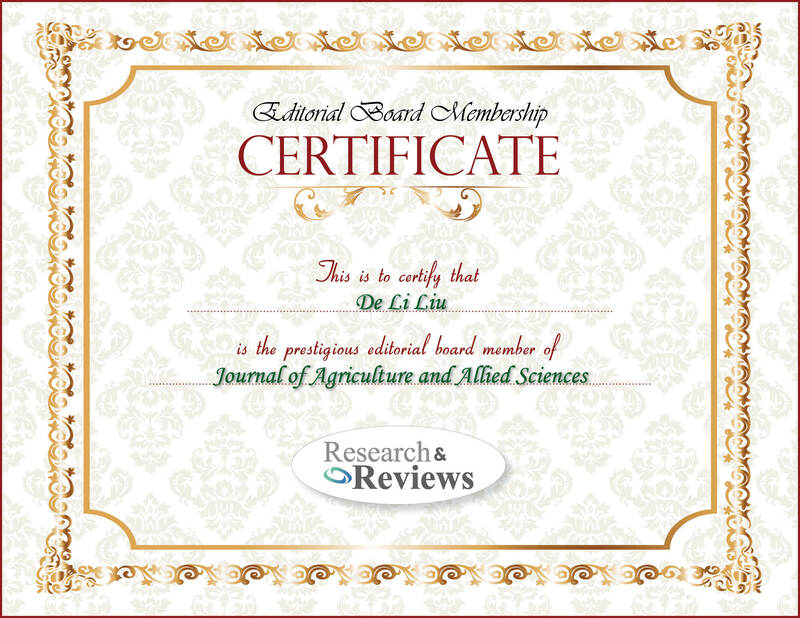 De Li Liu is principal Research Scientist with NSW Department of Primary Industries (NSWDPI), Australia. He is a computer modeler with 26 years research experience in developing crop growth models, computer simulation and decision support systems, and modelling climate variability and climate change impacts on agricultural system. He joined NSW Agriculture (now NSW DPI) in 1997 after working with Bureau of Sugar Experimental Stations (BSES) for 7 years as Postdoctoral Research Fellow and Research Officer, where he developed a physiological-based sugarcane simulation model (QCANE). Recently, he developed a standalone GIS based Climate Change Adaptation Strategy Tool (CCAST), weather generator-based statistical downscaling model (WG_SDSM). He has published over 70 scientific journal papers and over 70 conference papers and is currently Adjunct Professor at Charles Sturt University and a member of Graham Centre for Agricultural Innovation. His research interest includes Irrigation of field crops, Crop physiology, Field crop production, etc. Zakaria Fouad Fawzy - Professor - National Research Centre and Assessor in Egyptian Accreditation Council He is the first Egyptian researcher attended of the talented young scientist program in China. He got an opportunity for more than two international projects in Egypt as a principal investigator about Climate Changes Issues in China and Egypt. Dr Zakaria is professor in the Agriculture and Biological Division, National Research centre since 2013. 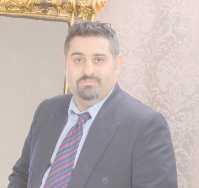 Also, he is Assessor in the Egyptian Accreditation Council. Dr Zakaria is Former President of the Youth Scientific Research Association. He was attended many scholarships and fellowships such as , scholarship “ PostDoctor “ in china from 2011 to 2012 and fellowship “ Talented Young Scientists Program” in China from 2014 to 2015. He created about four Memorandum of Understanding “MoU” and Memorandum of Agreement “MoA” between National Research Centre and other international scientific organization such as – Institute of Geographic Sciences and Natural Resources Research- Chinese Academy of Sciences and Beijing Institute of Technology- Ministry of Science and Technology – China. He is a member in many scientific organizations and acts as reviewer and referee as well as board member in the field of organic agriculture and climate changes issues for different national and international journals and organizations. Also, Dr. Zakaria won many awards and he was attend a huge number of conferences, training and workshops in Egypt and other many countries in worldwide as well as he was published five scientific books and more than 45 scientific research paper. Dr. Zakaria contributed significantly to the expansion of knowledge of organic agriculture and climate changes issues through public lectures on scientific research centers and various Egyptian and Chinese universities, and because he is principal investigator of some international and national projects he contributed significantly in helping to learn organic agriculture and climate changes and using smart climate agriculture as a new trend in the field of agriculture. He work a Progress Patent invention entitled “A new natural compound to increase productivity and immunity of horticultural and field crops " - Application No. 2077/2015 - Advanced side - Academy of Scientific Research and Technology - Patent office. His research interest includes Plant Pathology and Nematology, etc. Yusuf Leonard Henuk is a Professor in the Department of Animal Science, Faculty of Agriculture at University of Sumatera Utara (USU), Medan, North Sumatera, Indonesia. He received a Bachelor’s degree (S1: ‘Sarjana’) from the Faculty of Animal Science, the University of Nusa Cendana in Indonesia from 1980-1984. He obtained Master in Rural Science (M.Rur.Sc.) from the University of New England from 1991 – 1995 and continued Doctor of Philosophy (Ph.D) from the University of Queensland from 1998 – 2001. Both in Australia. Zijian Li earned her doctoral degree from Case Western Reserve University in the year 2016. Prior to that he is having B.S. in Chemistry from Jilin University 2011. Currently he is a Associate Environmental Engineer in Parsons Corporation since 2016. Dr. Thanaa Shaban Mohamed Mahmoud appointed in 2003 to work at Pomology Department, National Research Center (NRC), Dokki, Cairo, Egypt to works as Agricultural specialist third. In 2005, she promoted as Assistant Researcher at Horticultural Crops Technology Department, (NRC), Dokki, Cairo, Egypt. Dr. Thanaa Mahmoud has received her M. Sc. degree in Agricultural Science, Pomology in 2008 from Pomology Department, Faculty of Agriculture, Cairo University, Egypt. Her M. Sc. entitled "Effect of shading and pruning on growth, flowering and fruiting of olive trees". In 2012, she received her Ph. D. degree in Agricultural Science, Pomology in 2008 from Pomology Department, Faculty of Agriculture, Cairo University, Egypt. Her doctoral dissertation entitled "Improving growth and productivity of olive trees through raising photosynthesis efficiency ". Her M. Sc. and Ph. D. supervised by Professor E.S. Hegazi. Pomology Production. Post-harvest of Fruits. Nutrition fruit trees. Management orchids and Environmental stresses. Born on June 1, 1960 in farming community, he earned B.Sc. (Agri.) degree in 1985, M.Sc. (Agri.) in Agronomy in 1987 and Ph.D. in 2004 from the then Gujarat Agricultural University. He did MBA in HRM from IGNOU. He cleared NET in 1999 and CCC+ in 2004. He maintained first class throughout his academic career. After serving in rural development and regional rural bank for two years, he joined Gujarat Agricultural University as Senior Research Assistant in 1989. He worked at various stations viz., Sugarcane Research Station, Navsari, Junagadh & Kodinar; Millet Research Station, Jamnagar; College of Agriculture, Junagadh; Agricultural Diploma School, Junagadh and Department of Agronomy, Junagadh. He has 29 years’ experience in teaching, research and extension and also served at various capacities including Assistant Registrar (Academic), Assistant Registrar (Administration), Drawing-Disbursing Officer and Registrar. His areas of research include organic farming, weed management, nutrient management, water management, cropping systems, dry farming, precision farming, tillage, agrometeorology. Specialization: Agronomy: Organic farming, Weed management, Nutrient management, Water management, Cropping systems, Dry farming, Precision farming, Tillage, Agrometeorology etc. Professor K. N. Bhatt is a professional Researcher in Social Sciences with specialization in environmental economics, social development and Corporate Social Responsibility. He obtained his Ph. D from University of Allahabad. He has been CSR advisor/consultant of various corporate bodies for past several years. Dr. Bhatt has directed and authored/co-authored 25 research projects sponsored and funded by the International and National organizations. He has published 8 books and forty four research papers in Journals and Edited Volumes. He has widely travelled around the globe on visiting academic assignments in prominent institutions of the world: 2nd International Conference on Plant Science and Pathology, Bangkok, June, 2017, Visiting Professor in Suan Disit University, Bangkok, July, 2017, 7th Global Summit on Agriculture and Horticulture, Kuala Lumpur, Malaysia, October, 2016, Thaksin University, Bangkok, Thailand, June, 2016, Suan Dusit University, Bangkok, June, 2016, ECO Asia Impact Centre, Chiang Rai, Thailand, June, 2016, Thailand, Global Evaluation Partners and CoA-South Asia, Kathmandu, Nepal, Nov., 2015, AGPA-KIPA, Seoul, August, 2015, CALS, Cornell University, Ithaca, USA, June, 2015, Laval University, Canada, May, 2015, Canadian Evaluation Society, Montreal, Canada, May, 2015, AGPA-NIPA, Indonesia and University of Indonesia, Jakarta, August, 2014, WCPA, KAPA, Daegu, South Korea, June, 2014, Visiting Professor, Manipal University, Dubai, 2013, SJAB Institute for Science and Technology, Dubai, 2013, Thaksin University, Bangkok, 2013, Suan Dusit University, Bangkok, 2013, BIPA, Manama, Bahrain (2013), University of New Mexico at Wisconsin, Madison, USA (2012), NIDA, Bangkok, Thailand (2012), Civil Services Commission, Male, Maldives (2012), University of Roma Tre, Rome, Italy (2011), Limerick University, Ireland (2010), University of Melbourne (2009), University of Western Australia, Perth (2009) and Curtin University, Perth (2009). Dr. Bhatt is Executive Editor/Member Editorial Board/Reviewer for Several Refereed International Journals: Agrotechnology Open Access, International Journal of Food Science and Nutrition Studies, Journal of Agricultural Science and Technology A and B, American Journal of Experimental Agriculture, Journal of Agriculture and Ecology Research International, International Research Journal of Agricultural and Food Sciences, International Journal of Plant and Soil Science, Journal of Literature and Art Studies USA, Journal of US-China Public Administration, Journal of Bioscience and Biotechnology Discovery. He is Associate Member of Two Reputed Canadian Institutions from February 27, 2013 0nwards: 1. Institute Hydro-Quebec en environment, development et societe (Institute EDS), Quebec, Canada and 2. University of Laval, Quebec, Canada. Dr. K. N. Bhatt works as Professor of Economics in G. B. Pant Social Science Institute, Allahabad Central University, Allahabad, India. Social Sciences with specialization in environmental economics, social development and Corporate Social Responsibility. My interested topics including Groundwater Hydrology, Irrigation and Drainage Engineering, Sustainable Development and Environmental Assessment, Climate and Integrated and Sustainable Water Resource Management, Water System Engineering, Water Resources Planning, Rainfall, Geochemistry, Natural Hazards Research, Agricultural Science, Geosciences Research, Discover Mathematics Research, Artificial Neural Network, Genetic Algorithm and Integrated Water Resource Management.